One of these things is not like the others... Troy Brouwer and four Olympians. Coach Joel Quenneville’s pre-game speech before Sunday’s game in the United Center will probably focus on reminding his young team that games consist of three periods, not two. In the first 40 minutes on Saturday night, the Blackhawks dominated every aspect of the game in Minnesota. Cristobal Huet stopped 11 of the 12 shots he faced, while Niklas Backstrom allowed five of the Blackhawks’ 12 shots to find the net as the Hawks stormed to an emphatic 5-1 lead. 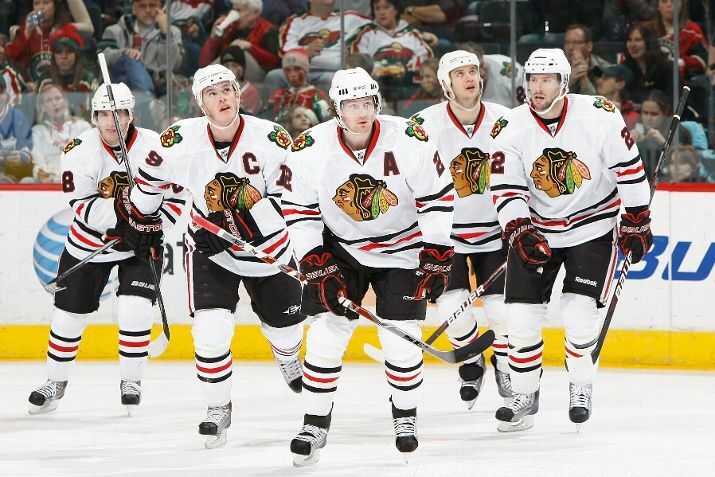 In fact, the scoring for the Blackhawks read like a countdown. Patrick Sharp scored his 15th, Jonathan Toews his 14th, Kris Versteeg his 13th, Troy Brouwer his 12th and Marian Hossa his 11th, in that order. Patrick Kane picked up two assists to stretch his point streak to 11 games, and Versteeg’s goal extended his quiet point streak to seven in what looked like a blowout. The crowd was dead, the Wild were overmatched, and the high-powered offense of the Blackhawks could do no wrong. But that was the first 40 minutes. To begin the third period, in a move that perhaps signified the coming storm, Minnesota pulled Backstrom in favor of Josh Harding. At the time, the change appeared to mean little more than the Wild trying to put a bandaid on a terrible night. After the game, it proved to be precisely what the Wild needed. What followed was a complete contrast to everything the Blackhawks have done this year in becoming the best team in the Western Conference: the Blackhawks stopped playing. The Hawks began passing the puck in a way that looked more like the legendary “Four Corners” basketball offense than an aggressive hockey team. They stopped fighting for pucks in the corners, were out of position regularly, and the Wild took advantage. To the credit of Minnesota, they didn’t stop skating, fought for pucks, continued to work hard and capitalized on lazy goaltending by Cristobal Huet to erase a four-goal deficit in only seven shots. Yes, those number are right. Four goals. Seven shots. The flurry that shell-shocked the Hawks happened when the Wild scored three goals in just over two minutes. The first, scored by Jim Johnsson, came off a nice pass from former Blackhawk Andrew Ebbett. The second, by Mikko Koivu, came only 45 seconds later, and the third, by Marek Zidlicky, was only 80 seconds later. Huet looked more like the goaltender that had many fans questioning his position as the team’s number one netminder in early October than the one that ranks fourth in the NHL; he dropped to his knees early and allowed long rebounds and a wide-open top shelf, all of which were exploited by the aggressive Wild. With only a minute and a half left in regulation, Guillaume Latendresse scored his second goal of the game off a Huet rebound to tie the game. The crowd was now fully into a game that appeared to be over after two period. 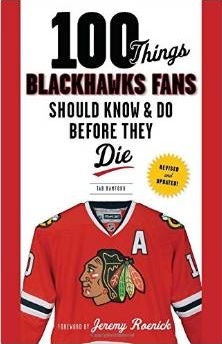 Unfortunately, the Blackhawks bought into that thought as much as the crowd, and paid the price. The overtime period featured solid back-and-forth action, but it was clear that the Blackhawks didn’t have their mojo back. Harding made a number of impressive stops, keeping all 13 shots he faced in 25 minutes out of the net. He was also great in the shootout, where the Blackhawks could only get a Patrick Kane goal in eight rounds. When Owen Nolan scored the first shootout goal of his 1,166 game career, John Madden failed to answer and the Blackhawks wandered off the ice not knowing what had just happened to them. Gone is the Hawks’ five-game winning streak, and Sunday we’ll see if their swagger has been hurt when a good, healthy Anaheim team invades Chicago. Huet’s performance raises questions yet again about his ability to be a championship goaltender. On Saturday night he allowed five goals in 21 shots, and he has now allowed nine goals on only 63 shots (.857 save percentage) in his last three starts. Those three starts, in St. Louis and two against the Wild, haven’t been against the elite of the NHL and yet Huet has not been effective. Whether or not he’ll be in net on Sunday for a chance at quick redemption will be interesting.